A business suit is essential to you as a professional, whether you're a low level employee, a manager or an entrepreneur. When it comes being a professional, looks matter a lot to your prospective clients. If you don't appear professional, then certainly no one will look at you as one and will not believe what you say. They might think that you're just in it for fun, and not serious business. 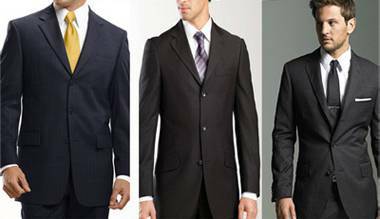 Choosing the right business suit is also important when you're going to buy a few for your wardrobe. You never know when you'll need to wear one, by the way, so you should always have one ready to grab and put on when the need arises. It may seem easy to choose a business suit but actually you have to be very meticulous as well because you don't want to end up with one that will actually make you look stupid or ridiculous in front of your clients. Yes, business suits can make or break your image. It's not enough to just wear a suit, you have to wear one that can make a good impact to your professional contacts. So how do you make sure that the business suit you're going to wear on a meeting is going to make the right impact on your audience or prospective clients? Your goal is not to stand out and be too attractive when you're going to a business meeting. All you need to do is just to appear professional so that you'll be noticed and taken seriously. Your business suit is part for your arsenal for making a good impression on your clients so that they'll listen to what you have to say. If you wear a color that stands out too much, your clients will end up commenting on what you're wearing instead of paying close attention to what you are saying. That's not a good thing, because they wouldn't hear what you have to offer them and you potentially lose the chance of doing business with them. There are a lot of colors that you could choose from, but only a few are actually appropriate for a business meeting. Black would be a good color for a business suit, because it doesn't stand out and is very clean to look at. There are many cuts for a business suit. In this case, you have to choose the one that fits you the most. For example, slim-cut business suits would be great for you if you have a well-developed physique that you take care of through exercise and weightlifting. On the other hand, you can add bulk and length to your body if you're of a small statute by wearing two-buttoned suits. There are plenty of options to choose from when it comes to buying a business suit. Just know your preferences and your body's dimensions in order to decide which one fits you best. If you need to buy business suit , there's no better source in the Internet than Fashion Suit Outlet! You could find a lot of business suits available here, no matter what style or cut you'd like your business suit to be.